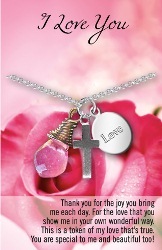 I Love You Necklace Lead Safe Pewter Charms Comes with the following poem: "Thank you for the joy you bring me each day. For the love that you show me in your own wonderful way. This is a token of my love that’s true. You are special to me and beautiful too!"